Finally, finally I got around taking a new set of pictures of Irtfa'a. But she does not like her picture taken. I am not quite happy with this set either, but I want this to be done now, so here she is... She is a beauty. Knit from Wetterhoff's Silvia with 3,5 mm needles. Silvia is partly wool and partly silk (70%/30%). I have used this yarn often and this is a good yarn. I knit for my daughter a shawl from this yarn couple of years ago and she used her shawl everyday as a wrap around her neck during the winter months and it took wear very well. I washed and blocked it again in midwinter and the shawl was again like new. (Now the shawl is like a rag but really delicate wool shawl is not eternal.) I knit Irtfa'a during the long dark nights and it was more or less just trusting the pattern and not worrying too much of the knitting and since Anne's patterns are so well written, this shawl turned out just fine - though I must confess that there were times when I wished I had not taken black yarn. One of my New Year's resolutions was to look at the closet and either refresh some of the old outfits or toss them away (take them to goodwill). I really like this linen Marimekko dress but I have always felt that it needed something nice added to it and finally that is done and off the list. If you'd like to see better pictures off the pattern, just hop over to Anne's and there are plenty of good pictures of her. Michelle at Boulderneigh nominated me for an award some time ago. Thank you Michelle! I really love your sheep pictures! My sweater from the last post is almost done but she is set aside for a bit, because I am not sure how to fine tune the fit and the look. She needs quite a lot of work yet and since I am not quite sure what it is, she is resting. So now I need to come up with something new. This "something new period" always means starting at least ten different patterns; I pick up a pattern or idea, knit for a bit and then I rip with frustration and again start over so that at the moment I am not sure where I will be next. It feels kind of nice to be dating yarns and patterns again and I am not going to worry if I will stay single for a bit. 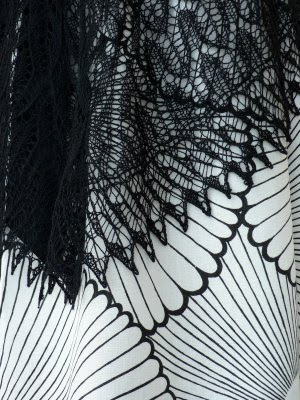 The shawl and the dress is a perfect match - they look beautiful together!!! This is very, very beautiful. I am glad to see your post this morning, I always wonder what new thing is percolating! Beautiful - and perfect with the dress! 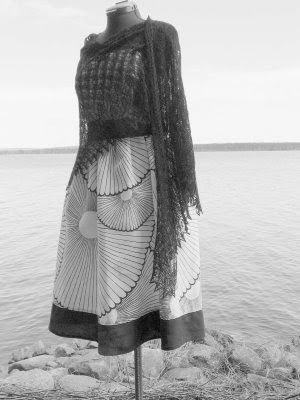 Irtfa'a is beyond lovely, just stunning and so very beautiful with your linen dress! That shawl and dress together are a match made in heaven! And I'm tickled that you've even LOOKED at my sheep pictures! Your vision never ceases to impress me, Lene. Lovely work on the shawl, and a perfect companion piece to the dress. But the most amazing part is the way you saw the partnership before it existed. And then created the "other" piece of the pair. Congratulations! oh lene that is just gorgeous; thank you for the nice compliment on the pattern! i LOVE that dress . . . The shawl and dress look so elegant. And I am glad to know that you are remaking clothing as this is something I do to. Love to see more from your closet. So pretty. The shawl border is incredible!! the shawl is really very beautiful!!! Made for each other! That outfit would make me want to go somewhere......anywhere, just to have a chance to wear it. Beautiful -- especially with that dress! 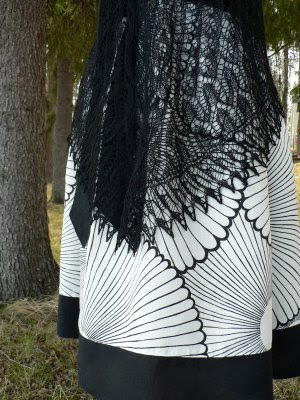 such a gorgeous shawl! and in black yarn, too - you are one patient woman :) also, i have that same dress! it's one of my faves. I have always wondered what kind of yarn that was. Thank you for answering that for me.